And honestly, we couldn’t be more excited! We love ice cream. We love sandwiches. And we especially love ice cream sandwiches. For our twist on this just-in-time-for-summer trend, we picked up a six-pack of granola bars and turned them into three totally different ice cream sammies. To make all three, there’s just one basic technique, so lets walk through the steps, and then I’ll introduce you to our rad riffs. Though you can certainly use just one flavor of bar, we started with a box of triplet Nature Valley Granola bars. Each ones is easily transformed into a tasty treat. Brace yourself. From here, icescreaming (that’s a thing!) your ice cream sandwiches is pretty simple. #1: Slice right through the bottom 1” of a carton with a sharp bread knife (this works especially well with a frozen-solid carton). #2: Now slide the ice cream out of the carton and (working quickly) slice that ice cream into 1” slices. Voila! 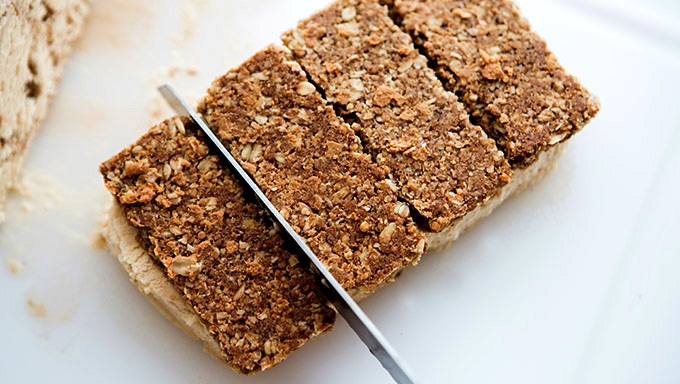 You have a perfect sized slice for granola bars. Place your 1” slab of ice cream on top of four granola bars, top with four more, and slice into nice, uniform pieces. Pop your bars on the prepared baking sheet. Cover with plastic wrap and freeze until firm. I prepped these a full day in advance, so I recommend overnight freezing to ensure your bars are in good form. Once frozen, there’s one step perfectionists (like me) will want to do: pull your frozen bars from the freezer and use a sharp knife to trim the edges of the ice cream. It’s the secret to nice, even and gloriously sharp edges. From here, it’s dippin’ time. Depending on the flavor you choose, you’ll need to microwave either white or dark chocolate with coconut oil. Don’t skip this step! The coconut oil thins out the chocolate and turns it into a DIY candy shell coating. Once melted, you’ll dip the bars in melted chocolate or drizzle them with white chocolate after coating in sprinkles. Check the specifics below, so you can create the sammie of your dreams. For this version, we’re going over the top with chopped peanut butter cups. Last step: the bars go back into the freezer until ready to serve. Ready to see our flavor riffs? Here they are! The tutorial above just walked you through how to make killer diller PB Explosion Granola Ice Cream Sandwiches. Peanut butter granola bar. Peanut butter ice cream. 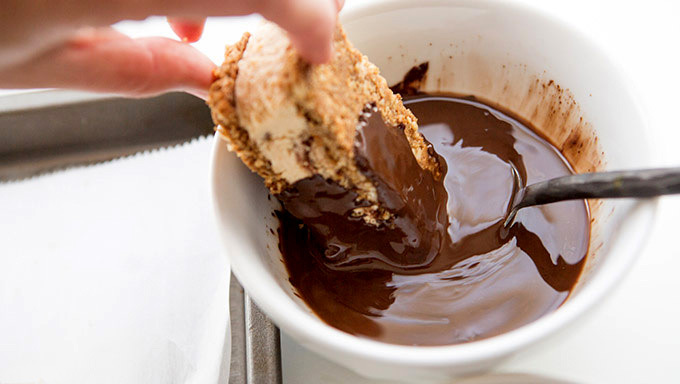 Peanut butter cups on chocolate dipped dip. Yes, please, and thank you. Looking for something a little sweet & colorful? Tuck cake batter ice cream between two Oats ‘n Honey bars, dip into rainbow sprinkles and drizzle with white chocolate. Pretty as a pink pony! And finally, what would ice cream be without over-the-top caramel and chocolate? We call these our bliss bars because, yummmmm. Oats ‘n Dark Chocolate granola bars are filled with pralines and caramel (or chocolate ) ice cream—you decide!. Once frozen, a thick layer of caramel and chopped nuts are stacked on top before submerging into chocolate, chocolate and more chocolate. See what we mean? Pure bliss. Of course, these three flavors are just the beginning of so many combinations. We’d love to see your take on these tasty treats. Upload a photo to Instagram and tag it #tablespoon so we can see your frozen granola bars!